The Marblette Corporation were plastics manufacturers, located here on 30th St. in Long Island City, Queens, NY, for fifty years (approximately 1931 to 1982). This notice appeared in the New York Times, 28 Sept. 1931, pg. 38, "The property at 37-18 Thirty-first Street and 37-21 Thirtieth Street, Long Island City, was leased by Lehr-Benes, brokers, for the Operators and Traders, Inc., to the Marblette Company." Industrial Research Laboratories of the United States, by National Research Council (U.S.), 8th edition, 1946, pg. 201, included the following: "Marblette Corporation, 37-21 Thirtieth St., Long Island City 1, N. Y. President: Herbert C. Kranzer. Research staff: Max Hilrich, Director. 1 chemist, 1 engineer; technical personnel 1; additional personnel 1. Research activities: Phenolic resins. (Research initiated 1929.) Library: 125 volumes." A phenolic resin is a heat-cured plastic used in commercial and home applications. According to www.wisegeek.org, "In the early 20th century, the resin was mixed with wood fibers to create Bakelite(R), a popular material for oven handles, cooking tools and decorative door and cabinet parts." Also, "Phenolic resin board is widely used for electronic circuit boards into the 21st century. The resin is often mixed with small amounts of natural or synthetic fibers to prevent breakage, because the resin can be brittle when cured. The boards do not conduct electricity and will resist heat generated by electronic equipment." The wisegeek website shows telephones and radios that used Bakelite in their covers. As explained by William Grimes, New York Times, 14 Jan. 1996, pg. BR14, reviewing American Plastic; A Cultural History by Jeffrey L. Meikle. Rutgers University Press, 1996, "After an immigrant industrial chemist named Leo H. Baekeland transformed phenol and formaldehyde into a moldable stuff he called Bakelite in 1907, plastic served as an unglamorous substitute for celluloid, rubber and shellac in electrical insulation, pens and buttons. ... During the Depression, Mr. Meikle writes, plastic showed a new face. Companies like Catalin and Marblette brought color to the spiffy radios and costume jewelry that now fetch top dollar in antique shops." Marblette was a competing product of Bakelite and a registered trademark of the Marblette Corporation, 37-21 30th Street, Long Island City, New York. It was registered 3 December 1935 and described as "Synthetic resins of predetermined form, such as rods, tubes, sheets and other configurations; first used in commerce 4 April 1929." Herbert Charles Kranzer (1903-1964), president of Marblette in 1946, received the following obituary in the New York Times, 25 Sept. 1964, pg. 41, "Herbert C. Kranzer, a certified public accountant and a vice president and treasurer of United Hias Service, the Jewish migration agency, died of a heart attack Sunday in the hospital of the Athens airport in Greece. He was 59 years old. Mr. Kranzer, who was to have participated in the agency's migration conference in Geneva on Oct. 4-6, formerly had been an executive with the Marblette Corporation in Long Island City, Queens, and McGinnis' Broadway Restaurant. He also was a leader in the United Jewish Appeal, the American Joint Distribution Committee and the Cooperative for American Relief Everywhere. A sister, Mrs. Louis Sussman, survives." Newspaper accounts in 1952 and 1953 indicated that Marblette was expanding its facility in Long Island City. 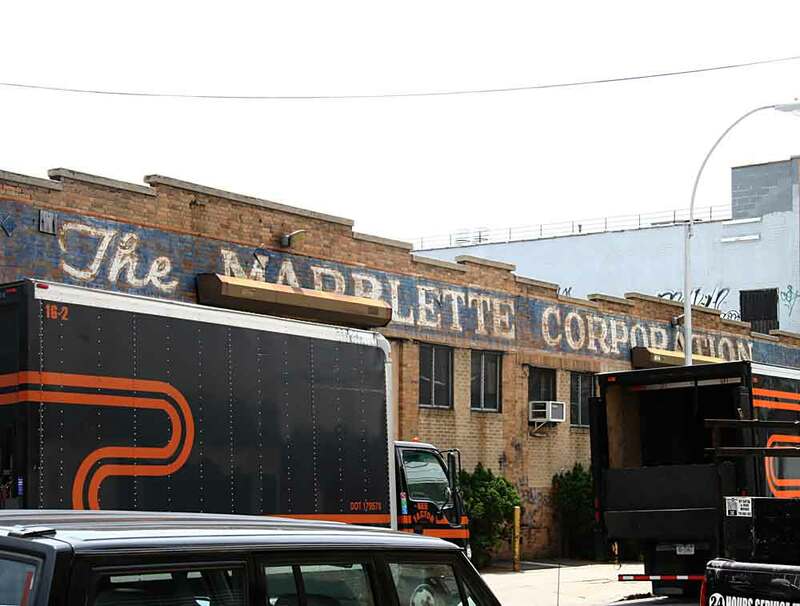 "Planning for the expansion of its present plant, the Marblette Corporation, manufacturer of plastics, of 37-21 Thirtieth Street, Long Island City, Queens, has purchased the adjoining vacant corner plot of 7,500 square feet from A. Russo. The same was negotiated by Charles J. Mandia as broker" (New York Times, 1 March 1952, pg. 24) and "The Marblette Corp., plastic manufacturer, has bought from Dietrich Bros. a vacant plot adjacent to its building at 37-21 30th St., Long Island City, Queens, through Charles J. Mandia, broker" (New York Herald Tribune, 3 Nov. 1953, pg. 26). In 1956 Industrial Research Laboratories of the United States, by National Research Council (U.S.), 1956, pg. 306, included, "Marblette Corporation, The, 37-21 30th St., Long Island City 1, N. Y. President: Samuel Glickstein. Research staff: Max Hilrich, Research Director; Robert A . Grayson, Technical Personnel Director. 1 chemist, 3 engineers; additional personnel 2. Research activities: Phenolic, epoxy and urea resins." In 1967 Marblette Corp. was acquired by Allied Products Corp. (Wall Street Journal, 6 July 1967, pg. 5), and then again in 1974 by the Etherington Companies of New Haven, Conn. (The Hartford Courant, 9 April 1974, pg. 53). Their location on 30th St., Long Island City, was listed in the Manhattan telephone directory through 1982.